The Only Actor's Studio in Houston with Classes, Readings, Film and TV Productions, Film Festivals - all under the same roof. In December 2003, two young and passionate filmmakers - San Banarje and Trisha Ray - formed Next Actor Studio in Houston to create an in-house group of actors who would be trained in on-camera acting so that they could participate sincerely and efficiently in creating feature and short films under the banner of our production company Lake Camp Productions. Following our footsteps, a few years later, there opened an acting studio, using a variation of our studio's name in Houston - that often confuses people and we receive several calls about that. 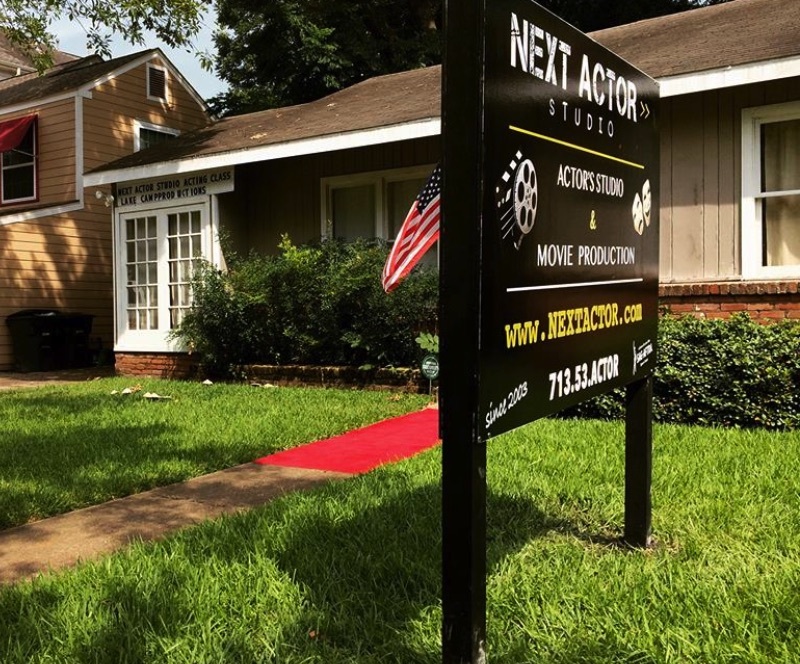 Please note : Next Actor Studio is an actor's studio where we train not only acting classes, but also filmmaking, editing, screenwriting classes, and we have our own film produciton, and our own film festival (Niff Houston). Our only other branch is our post-production facility in Los Angeles where our films get completed. Our films have been opening in film festivals around the globe, notably the Museum of Modern Arts (MOMA), Cannes, New York, Hoboken and others. We have a Christian filmmaking department where several Christian films are made with Next Actor students, under the banner of our Christian film production partner Boat Angel Family Films of Arizona. Today the studio, a division of SAG - AFTRA signatory Next Actor Films, has a team of award-winning filmmakers, screenwriters, editors, musicians and actors who collaborate frequently to churn our shorts and features that get screened to a wide audience via private screenings, film festival releases, worldwide theatrical and Blu-ray/DVD releases etc. The studio has provided opportunity to several deserving students to build their resume and receive hands-on training by being a part of the films made by the studio. Our production company Lake Camp Productions makes 2-3 feature films a year that get released worldwide, premiering in different film festivals, thus giving an exposure to the talented students. We also have started our own Next International Film Festival (Niff Houston) that takes place in October for 5 days in Houston. Our students enjoy the privilege of being a part of a true artistic community to enhance their involvement in this industry, build resume and receive hands-on training through internship opportunities. Next Actor Studio works with several A List Agents and Producers in Hollywood and Europe. That is the reason, Next Actor Productions have been able to cast several well-known actors in our Houston projects, such as Oscar and Golden Globe nominee Eric Roberts, United Nations Speaker and producer Kamala Lopez, KISS founder Gene Simmons' daughter Sophie, actress and former supermodel Shannon Tweed, NBA champ Rick Fox, Disney star Andrea Guasch, Television star and brother of Jerry O'Connell, Charlie O'Connell, Martin Sheen's brother and Charlie Sheen and Emilio Estevez' uncle Joe Estevez and several others. A list of our films can be found on IMDb by clicking here. Next Actor Studio teaches on-camera acting. Therefore, all our acting classes are recorded, including Shakespeare. Voice on-camera classes record the voices (not images). Students may bring an SD card or request the studio to email their performance video files. Screenwriting and filmmaking classes are not recorded. The classes are usually method acting based workshops with focus on emotional and sense memory and the importance of intellect, aesthetics and ethics in acting. The acting classes are geared towards acting for editing, making impression at a film audition, understanding choices, Through exercise and bits, the classes aim to bring the best out of a student while helping them reach their emotional peaks.Students must register at least two days prior to start date of class to receive scripts to work with in session. Incomplete registrations are discarded after 12 hours. Students are required to remain respectful and courteous to fellow classmates and staff at all times. Our behind-the scene classes allow students knowledge by working hands-on with scripts and also provide them opportunities for internship and crew work during our in-house productions. Students are requested not to miss scene study classes as that hampers their scene partner. Make-up classes are allowed but please let the studio/teacher know you will miss a class so you are not given a scene for that week. You may schedule a make up class via email. We welcome sincere students. Auditions may be required for some classes. Students who enroll in Advanced Stanislavski Session must have prior Stanislavski Training and willing to participate in our practice and rehearsal session to assimilate the method. The classes are geared towards acting for editing, making impression at a film audition, understanding choices, Through exercise and bits, the classes aim to bring the best out of a student while helping them reach their emotional peaks. Our students have been working as hosts and actors in Television Network (CW39, Jimmy Kimmel Live, Grey's Anatomy), writers at Forbes, Huffington Post, Houston Chronicle; recurring actors in soap operas and cinema in Mexico, Argentina, France and Spain to name but a few countries outside of USA. We do reserve the right to admission. If we do not admit you, or if a class is full, your card will not be charged and you will not receive a seat confirmation. For a serious student, looking to learn and receive proper on-camera training, this is the right place where classes are taught by professionals who are currently working in the industry, and therefore are knowledgeable about the changing trends and technology, and train students to have a long-lasting career in meaningful works. The studio itself provides a platform for our acting, filmmaking, screenwriting and editing students to collaborate with each other and work in shorts and independent films, start their IMDb resume, receive hands-on training. Our students yahoogroup for casting calls notify students of production listings and auditions that they can go to, and if they pass it, get cast. Script reads, movie nights and rehearsals of productions are excellent ways to take the craft beyond classes. Screenwriting students can hold readings of their screenplays with acting students. Chosen filmmaking students can use the studio and its equipments to make their shorts and screen them to an audience. Many students have started their career by working in Next Actor films first before moving on to work in larger projects. Most importantly, the studio enriches our students film vocabulary by introducing them to the works of legendary filmmakers, a list can be found here. Next Actor started in Dec 2003 and is run by working professionals who know the craft and have learned from being insiders in the industry. All classes are held at West U/Rice Village area in Houston. Our only other branch is in Los Angeles where we do post-production work of our films and videos, and hold classes for private students. Niff Houston is the Next Actor International Film Festival, held each year in October. Lake Camp Productions is our production department. Foreign students are welcome to apply to our classes, as long as they are already in USA with a valid visa. We do acknowledge that sometimes a class can be more advanced or basic for you or you prefer a teacher over another, and therefore we allow transfer of classes to a different session, with a different instructor. We do not offer refund if you cancel a seat after a class is in session or if you have taken a class and dropped out. We allow credits and transfer between classes at no additional cost. Refunds are available only if you cancel up to 72 hours before a session starts and we charge a processing fee of $40. We are located at Rice Village/West University area. To visit the studio, please contact us via email for an appointment. No Walk-ins please.